Ambadi is a leafy vegetable generally available in summer. 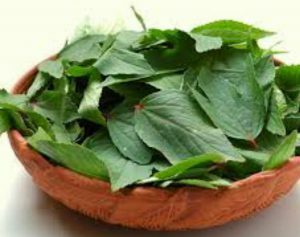 It is called Gongura / Roselle/ Sour Greens. This is sour in taste but it is different from Ambat Chuka. I’ve attached a photo of the leaves for reference. This is a traditional recipe from Konkan that requires very few ingredients. But the ones required are a must. If you skip any of them, then you will not get the right taste of the subji. This subji has Rice and Chana Dal (Split Chickpeas) in it. 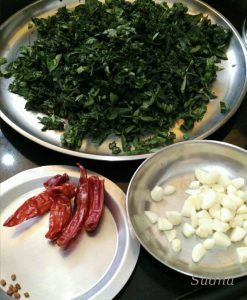 So it is complete meal in itself – Rice, Dal and Leafy vegetable. It tastes awesome with Rice / Jowar Bhakari. But you can have it with Roti or Rice as well. 1. 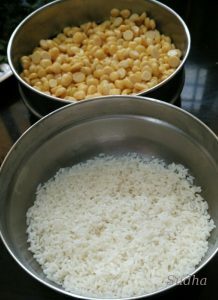 Soak rice and chana dal separately in water for 6 hours. 2. Clean ambadi leaves. You should take only leaves of Ambadi, no stem at all. wash them and chop fine. 4. Drain water from rice and Dal. If you are using long rice (Basmati / equivalent), crush rice using your hand to break into small pieces. If you are using fine (Barik) rice, no need to crush. heat oil in a small pressure cooker on medium flame. If you don’t have a pressure cooker, use a pan. 5. Add black mustard seeds, wait till splutters. 6. Add chopped garlic, saute till deep brown. 7. add turmeric, asafoetida (hing), fenugreek seeds and slit red chillies. 8. 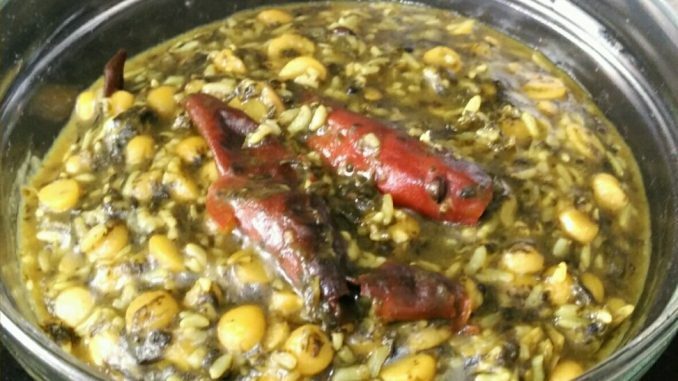 Add the chopped roselle (ambadi) leaves, soaked rice and chana dal. 9. Cover and cook for 2 minutes on medium flame. 10. Add just enough water to cover the above mixture, add salt. 11. Pressure cook, let the steam escape twice (two “whistles”). If cooking in a pan, cook covered till both Rice and Dal are cooked. Keep stirring in between and add water if required. 12. Open cooker after the pressure subsides. 14. Cook without lid to bring the consistency of broth (add water if required) while cooking over low heat. 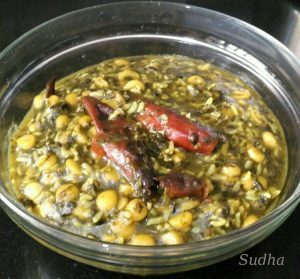 Serve hot with Rice / Jowar Bhakari or Roti / Rice. While having it with Bhakari, traditionally we add a spoonful of raw oil (preferably filtered groundnut Oil) to the subji. It enhances the taste. Don’t add oil if you don’t like it. Subji tastes yummy without oil also.